"If My people, who are called by My name, humble themselves, pray, seek My face, and turn from their wicked ways, then I will hear from heaven, and will forgive their sin and heal their land." The name Bethesda was originally given to a region of York county, SC, approximately 16 square miles in size. The Bethesda region was initially populated with immigrants from the northern part of Ireland, the majority being Presbyterians. Many of these early settlers came directly from Ireland, while others migrated down from Pennsylvania or up from the lower part of SC. Early chronicles show Bethesda Church as located 8 miles SE of York, 13 miles NE of Chester, 20 miles from the Broad River on the West, and 17 miles from the Catawba River on the East. Bethesda became a preaching station in 1760, the year during which the worshipping families of the community built a plain wooden building, located about one mile east of the present church buildings. Around this place of worship they also buried their dead. The year of official organization into a church is not known with absolute certainty but most sources name the year as 1769. The person responsible for the organization is generally thought to have been Reverend William Richardson, who at the time was stationed at Waxhaw Church. Along with Reverend Richardson, some of the early ministers to supply Bethesda were Rev. Joseph Alexander who served bullocks Creek, and Rev. Hezekiah J. Balch of Bethel. In 1774 Rev. John Simpson of Fishing Creek Presbyterian Church supplied Bethesda with half his time, which he until the close of the Revolutionary War. Rev. Simpson served Bethesda again tin the late 1780's until 1791. Between 1791 and 1794 Bethesda was served by supply ministers from Presbytery when they were available. Bethesda's first pastor was Reverend Robert Becqum Walker, who in 1794 was installed and ordained at Bethesda and whose pastoral relationship lasted forty years. Under Rev. Walker, known as Father Walker, Bethesda enjoyed great prosperity marked by rapid and extensive growth. He was instrumental in lifting the church to great spiritual growth. Father Walker attended The Great Revivals of 1796 - 1805, which started in Kentucky and Tennessee, returning to Bethesda with much vigor to teach this congregation at Bethesda and the surrounding area. From these activities the Camp Meetings at Bethesda began in 1802 and continued until 1864. People came from as far as 40 miles away staying in wooden tents erected about the church grounds. A large wooden arbor that could accommodate 2,000 worshippers was built in 1859. John Fonderson donated the original seven-acre tract of land where Bethesda Pesbyterian Church now stands in 1771. An additional ten acres were bought later from Richard Strait and John Swann, Jr. Over the years several more acres were added. The original wooden building used for worship was consumed by fire in 1780 Another building was erected a few feet south of the present house of worship. It was a wooden framed building with sides covered in split clapboard, and it stood for nearly forty years. 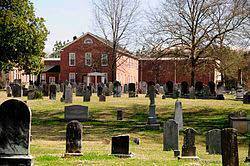 In 1820 the present house of worship was constructed with bricks hauled by wagon from Charleston, South Carolina. After about 20 years, two of the original walls had to be torn down and rebuilt because of a defect in the original design. Additional repairs were made in 1857 with the brick floor being replaced by a wooden floor and the antique wineglass pulpit by one of more modern design. Extensive improvements were made to the church in 1882 by an extension in back of the pulpit that recessed the pulpit and added a session room, the pews were placed closer and new ones added. Other improvements were new gallery posts, enlarged windows, carpet, and new pulpit furniture. Matching pulpit chairs, a communion table, and a chandelier were gifts from the women of the church. The women also replaced the pewter communion set with a silver service, and the velvet collection bags on the ends of the rods gave way to modern plates. Considerable work was again done in 1917. In 1977 Bethesda Presbyterian church was placed on the National Register of Historic Places and extensive changes were made to restore the building to its original design. A manse was in use by 1874, which was located on Armstrong Ford Road. Then in 1910 Mrs. Clara Lindsay and Mrs. Kate Williamson gave land for a manse in the area of Guthriesville, An engine fire burned the manse built on this property in 1935. Another manse was built near the same spot and remained in use until 1973 when the present manse was constructed near the church. Bethesda has continued to build during its 230 years of ministry, including an Educational Building (1954), Fellowship Hall (1959), Manse (1973), Tennis Court (1977), and a new Family Life Center (1992) that includes a Child Development Center. Bethesda is now in its 239th year of ministry. The original site of Bethesda Presbyterian Church was located about one mile east of the present site and around this original meeting house were buried her dead. In 1979 only three gravestones could be found at the old site and they were moved and placed in the present cemetery by Clay Boyd as his Eagle Scout project. A memorial marker was also placed with the original stones. Known to have been buried there also was Henry Neely, husband of Elizabeth. He was the first ruling Elder of Bethesda. There are several records of those buried in the present cemetery. One written by Mr. Ernest Jackson in his 1938 history of Bethesda Presbyterian Church, one compiled by Robert H. Walker in 1980 as his Eagle Scout project, and the present directory compiled by the Cemetery Committee with Roy Glover as Chairman and significant help from James Love and others. J. B. Fisher Surveyors performed a detailed survey of the cemetery for the directory. The cemetery is managed and cared for by a Cemetery Committee as one of the Sessional Committees of the Church with a Ruling Elder as Chairman. The committee has established a Cemetery Trust Fund to provide the financial means for perpetual care of the cemetery along with funds collected during the year from plot sales, memorials and donations for upkeep. Use of the cemetery is determined by the Cemetery Committee. The oldest identifiable grave marker in the cemetery is that of Peggy Black who died November 5, 1777. Also buried in the cemetery is Alexander Love who is credited with naming York County and James R. Martin, one of the framers of the Constitution of South Carolina. The number of war veterans known to be buried in Bethesda’s cemetery are: 34 Revolutionary War Veterans, 2 Mexican War Veterans, 81 Civil War Veterans, 23 World War I Veterans, 28 World War II Veterans, 1 Korean War Veteran, and 2 Viet Nam War Veterans. Maps are located in the Fellowship Hall for use in locating grave markers and memorials and for use in planning and grave site assignment. Cemetery Directories are available for a nominal fee in the Church Office. For further information concerning Bethesda’s Cemetery, contact the Church Office for the Chairman of the Cemetery Committee.